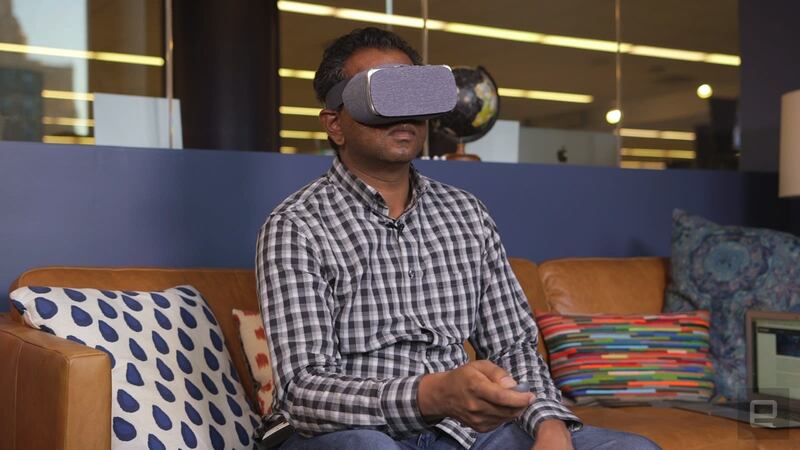 It was only a matter of time until Google moved on from Cardboard and started taking virtual reality seriously. Say hello to the Daydream View, the company's first mobile VR headset. Much like Samsung's Gear VR, it's powered by Android. But the big difference is that this $79 headset will work across a wide variety of Android phones that support Google's Daydream platform; it won't just be stuck on Samsung's hardware. It also stands out from the competition with a more comfortable design made from cloth instead of plastic. There's a lot riding on this headset and Daydream in general, but can Google really compete with VR companies that have been developing hardware for years? For the most part, it turns out it can. Be the first to review the Daydream View? Hooking up a phone to the Daydream View is also simpler than using any other headset I've seen. You just need to open up the front latch, drop the phone in with the screen facing the lenses and then close everything up and secure it with an elastic band on the top. It might look a bit clunky, but it's fairly secure. After that, tighten the headband, slip the Daydream View over your head, and readjust as necessary. 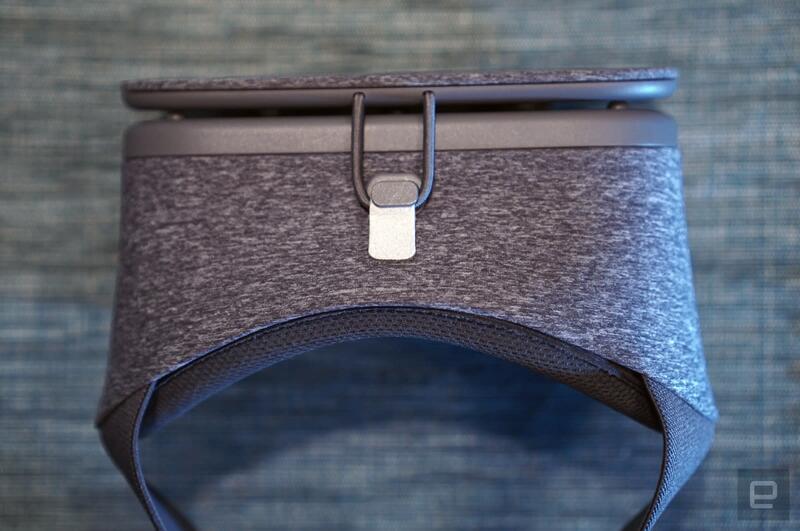 Instead of using Velcro straps, Google's headset relies on a band that's more like a messenger bag strap. It's fairly comfortable, but adjusting it is a bit tougher than simply dealing with Velcro. Keeping the theme of comfort going, the eyepiece is also made out of a soft and cushiony material. Best of all, you can actually remove the eyepiece for hand-washing. Which is a good thing: Based on my experiences with other headsets, you can bet it's going to get sweaty and grimy quickly. Since it's relying on fabric on top of a plastic frame, the Daydream View comes in at a featherlight 220 grams (0.48 pounds). The Gear VR, on the other hand, weighs 345 grams (0.76 pounds). 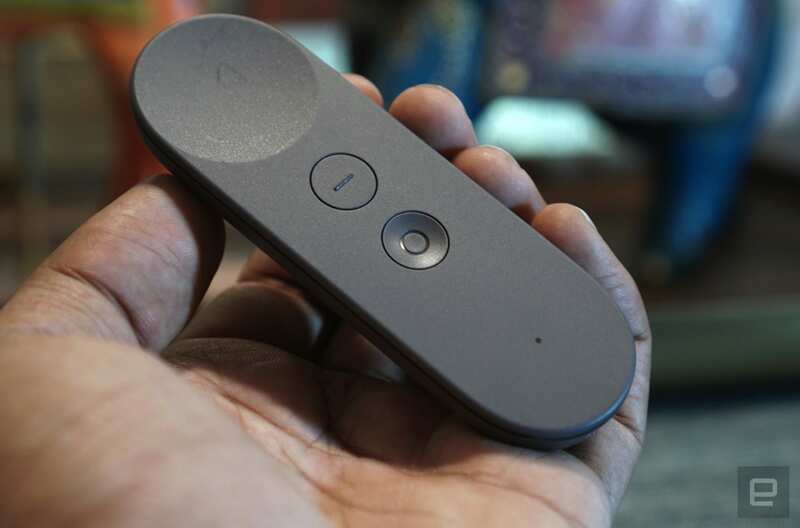 Another way Google aims to differentiate itself is with the Daydream View's motion controller. Like a vastly simplified version of HTC's and Oculus's remotes, you use it to navigate around Daydream's interface, play games and interact with apps. The motion tracking is generally pretty accurate, though I noticed some issues as its battery life drained down. The remote's simple layout -- touchpad on top, an app-specific button in the middle, a home button on the bottom, and volume controls on the sides -- also makes it easy to use while your eyes are covered. It charges over USB-C too, which is a nice touch, since your Daydream device will likely charge that way as well. Speaking of compatible phones, for now you can choose from Google's Pixel or Pixel XL to power the Daydream View. Other manufacturers are currently working on their own entries, though there's nothing you can actually buy yet. Google says Daydream phones will generally offer high-resolution displays (you can bet they'll likely be AMOLED, since that works best for VR); "high-fidelity sensors" for head tracking; and "ultra smooth" graphics. You'll also want to pay attention to resolution differences between Daydream devices. The Pixel XL has a 1440p (2K) display, for example, while the smaller Pixel has a less impressive 1080p display. In general, the more pixels you can stuff into a screen, the sharper your VR experience will be. I tested the Daydream View with the Pixel XL, likely because Google wanted to show off its VR headset in the best possible light. Since the XL is such a large phone, though, it sticks out a bit when it's attached to the Daydream View. It still fit just fine, but the setup looks a bit unpolished. 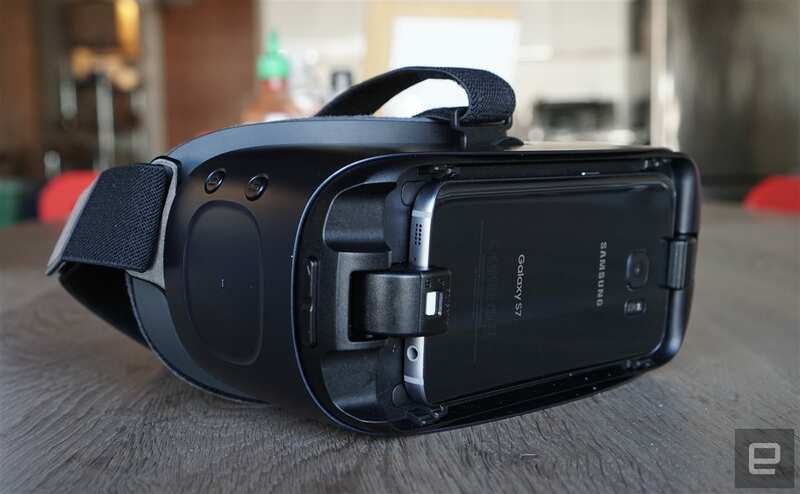 (Then again, the Gear VR looks even worse with a phone plugged in.) On the bright side, the Daydream View's single elastic band did a fine job of holding the Pixel XL in place, even when I shook the headset like crazy. Once you launch the Daydream app and slap the phone into a headset, you're presented with a fairly typical home screen. It features recently used apps and your own shortcuts up front, and a button on the bottom of the screen leads to your entire library. 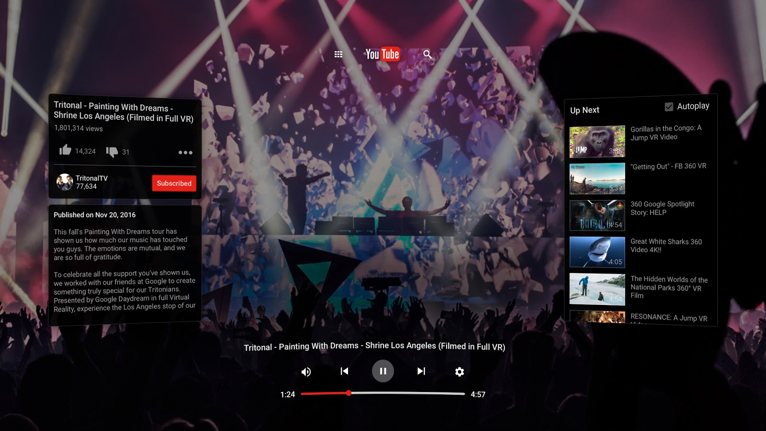 At launch, Google has a handful of its own VR apps to explore: With YouTube VR, you can view normal videos on a flat or curved plane, or dive right into immersive 360-degree videos. Street View lets you take virtual strolls around famous locations. And Play Movies allows you to use the Daydream View like your own personal home theater. Third-party apps include the Wall Street Journal, Star Chart VR and games like Mekorama and Hunters Gate. If it isn't abundantly clear by now, Daydream View is going squarely against the $100 Gear VR. I'm still a big fan of that headset, and if you're a Samsung phone owner, it's your only option. But moving forward, the mobile VR landscape is going to get more complicated. If you want the freedom to choose between different phones, rather than just Samsung's, then you're better off investing in the Daydream ecosystem. Daydream's big problem at the moment is its small selection of apps. There simply isn't that much available on Google Play for the platform yet. Google says that's going to change by year's end, though, with the addition of Netflix, Hulu, and the New York Times, along with plenty of other apps. This is one area where the Gear VR has a big head start, since it's been around for years and has a lot of content help from Oculus and Facebook. Still, Google is flexing its brand muscle a bit; it already has an exclusive VR experience for Fantastic Beasts and Where to Find Them, the upcoming film set in the Harry Potter universe. 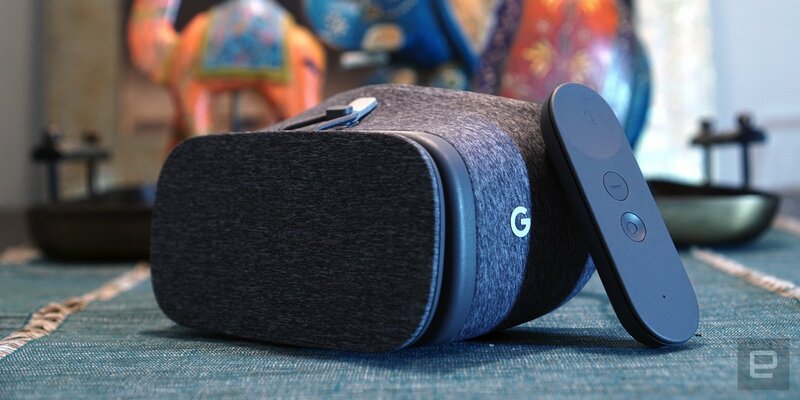 While the Daydream View doesn't completely reinvent mobile VR, it's a solid first step for Google. It's ideal for testing the waters of virtual reality without being locked into Samsung's ecosystem. But its success depends on more Daydream phones being released, consumers being willing to pay for a headset and developers jumping on the platform.